You may have heard the term ‘sector representation’ thrown around – it’s what we talk about when we talk about the market in general and when we get down into the specifics of truly diversified investing. Sector representation simply means that each of the 11 sectors of the market are accounted for in a fund or portfolio. But that’s just the beginning. The Global Industry Classification Standard (GICS) is a standardized classification system for equities. The GICS hierarchy begins with 11 sectors and is followed by 24 industry groups, 68 industries, and 157 sub-industries. A diversified stock portfolio will hold stocks across the majority, if not all, sectors. Diversification across stock sectors helps to mitigate risk when a specific industry or part of the economy takes a hit. A good example is the housing crisis – were you proportionally more invested in that sector, you would have taken a huge hit. By spreading your investments across a few areas you lessen the blow. What’s the advantage of sector diversification? The obvious upside of investing across a broader range of sectors is spreading your risk around. The ability to access a broadly diversified opportunity set, rather than focusing on the highest yielding segments of the market can up your return potential while also helping to diversify risk. What are the drawbacks of diversified investments? If there’s any downside to investing in the broader sector, it’s just a distorted version of the upside. Because you’re so spread out, you potentially miss out on any dramatic upswings in one industry or area. Also, as your level of diversification increases, your returns will be more likely to mimic the market average. All said, this isn’t necessarily a bad thing as the market has consistently gone up over time. That can be confusing to new or inexperienced investors, but it’s important to remember what the stock market is: a collective daily wager on the future performance of publicly held companies. And they are, to use a pretty technical measurement, making buckets of money right now. Our investors (and all investors, really) love diversification. 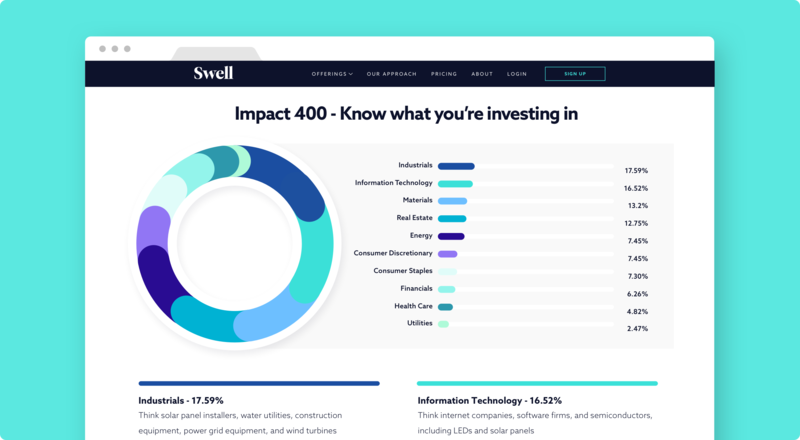 This is the best method of risk management and what we were aiming for when creating Swell’s Impact 400. It's easy to invest thematically in small and mid caps, but since so much innovation on the world’s biggest problems come from smaller firms, it can be hard to be diversified. So we devoted a huge effort into finding bigger firms that we are proud to call impact companies. We also added in some more small- and mid-cap companies to try and touch as many facets of the economy as possible. The Impact 400 is a new portfolio that runs alongside our time-tested and well-loved thematic portfolios. Many of our investors care deeply about all 6 of our themes and choose to invest across all of our offerings. But is that the same as sector diversification? The short answer is no. There are a few holdings that are innovating profitably in a few different industries – AECOM is a great example. You’ll find AECOM in our Zero Waste, Renewable Energy, and Clean Water portfolios because of its work with oil companies to improve air quality and reduce emissions, and its program management for water recycling and distribution systems. By having this company represented repetitively in your collective portfolio, you’re investing more of your money proportionally than in a company who is just in one of our themes. Should AECOM’s value decrease, so would a holding in half of your portfolios. The benefits of diversification and investing in the broader sector far outweigh the potential downside. Most importantly, it’s a hands-off way of building wealth. It’s impossible to time the market, the experts say don’t even bother. Emotions kick in, either panic or any number of tricky things your brain can do to you. Setting up recurring investments into a diversified portfolio can be the path of least resistance to a healthy financial future.